Main St/Hwy 22 south to left on Cty Hwy CC/Cty Hwy C eight miles to left on Hill Rd to property on left. All other seller's personal property. Kitchen refrigerator, double ovens, dishwasher. Bar refrigerator, dishwasher and wine cooler. Media electronics, sound system components, seven TVs. Hello, I’m interested in N11778 HILL ROAD and would like to take a look around. 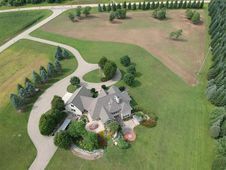 The details on N11778 HILL ROAD: This house located in Matteson, WI 54929 is currently for sale for $1,499,000. N11778 HILL ROAD is a 5,931 square foot house with 4 beds and 3.5 baths that has been on Estately for 519 days. This house is in the attendance area of Clintonville Middle School, Clintonville High School, and Rexford Longfellow Elementary School.